Psychometric tests are big business in the recruitment world today. A 2014 Forbes article estimated 60-70% of applicants are completing some kind of personality test when applying for jobs with US employers. You really can find these tests everywhere: closely guarded by experts with fancy degrees and leather patches on their elbows, or floating free on the internet for anyone to use (and misinterpret). Smart people have spent decades creating and testing and tweaking these tests to be predictable and robust. In the right hands, they’re a valuable tool. 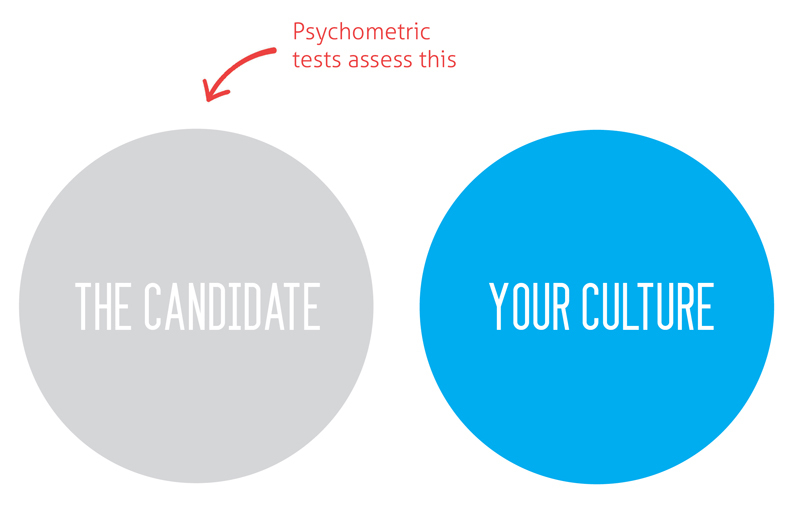 So what’s the difference between a psychometric test and a culture screening tool like Weirdly? Think about it like this. Personality-assessing psychometric tests are like a guy who can tell you everything there is to know about a particular set of tyres – all the vital measurements and the engineering that’s gone into making them – right down to the most minute detail. A culture screening tool like Weirdly is more interested in telling you whether these tyres are likely to work on your particular car, the way you’re driving it and in the conditions you’re planning on driving. A personality test will tell you lots about a person – how they communicate, what they care about, how they need to be managed. Weirdly (and other culture screening tests) will tell you one thing: is that candidate going to complement your culture? When is assessing “culture fit” a waste of time? Another recent Forbes article claimed 89% of poor hiring can be attributed to bad fit. But culture fit has become a controversial term in the HR and Recruitment circles. And with pretty good reason. The lazy way to think about fit is to look at the culture you have, and find someone who will perfectly slot into the team. They share the exact same cultural attributes and values as your current crew; they’re a perfect fit. But that’s a recipe for discrimination of the worst kind. That I-don’t-know-what-I-want-so-I’ll-just-get-the-same-thing-I-always-have style discrimination. The smarter way to think about culture assessment is by looking for a fit with some aspirational culture goal. Think you’ve got the perfect culture already so you can stop trying to improve it? You’re wrong. That’s like saying you’ve got the perfect relationship so you can stop working on it. Culture is an organic thing. It grows and changes as people and businesses grow and change. It can always be improved, just as people can always be better and kinder and smarter and stronger. When our business was facing down a particularly challenging period of growth, we needed more emphasis on the celebration part of our culture to carry us through the hard times. When our business gets stuck on a plateau and growth is stalling, we might need more emphasis on competitiveness to kick things into another gear. The values that make up our culture may stay pretty similar – competitiveness and celebration are always there, but how each of those values is emphasized naturally shifts as the business requires it and as our mix of people changes. Strategic culture fit, recognises that. And the things that qualify a candidate as a “good fit” will adjust too. Coming into that challenging growth period? A good fit is a candidate who has infectious optimism will amplify your celebrations. Hitting that plateau? You need candidates who will push the team’s competitive spirit to the next level. Whether you use the term Culture Add or Culture Fit, it should mean the same thing. You’re looking for people who will contribute what your culture needs to be better. Does screening for culture replace psychometric tests? The longer answer, like always, is it depends. A great culture screening tool like Weirdly refines your shortlist down so you only apply rigorous psychometric personality testing to a few pre-qualified candidates. It means you use psychometric testing to get a deeper understanding of candidates you already know fit the parts of your culture you need to emphasize. That may mean you’re not doing the heavy, expensive testing on as many candidates. Instead, you’re saving it for the people you know already have the potential to succeed. That’s how you turn big business, into smart business. Interested in using Weirdly for culture screening before you kick off the full psychometric testing? Just pick the attributes you want and it’ll take us 30secs to generate a quiz.